After six weeks of hopscotching the country for workouts, Jack still had something to prove after being passed over by the 31 NFL teams with first round draft picks. To confirm his surgically repaired right knee shouldn’t be a concern, he grabbed a basketball and threw down two-handed jams. His brother, Jahlen, captured them all on video. At UCLA, Jack wore No. 30, a nod to his stated goal as a freshman of “three-and-out”—as in, three years and then on to the next level. Through his first two seasons, he played in the mold of a modern NFL linebacker, taking down backs with his blistering sideline-to-sideline speed and covering tight ends, slot receivers and even the occasional outside receiver. But last September, three games into his junior season, he tangled with a wide receiver on a seven-on-seven drill in practice and tore his meniscus. Still, he insisted on making the jump to pro football in 2016. He withdrew from UCLA in the first week of October, and declared for the draft. After signing with his agent, John Thornton, Jack relocated to Tempe, Arizona, and worked with trainer Brett Fischer. Jack adopted a mostly Paleo diet (Fischer noticed too much refined sugar in the college student’s diet) and a strict regimen: at least five hours in the gym each day. At February’s combine, Jack was subjected to seven hours of poking and prodding by NFL medical staffs. He boasted that he felt like he was 100 percent, but truthfully, he wasn’t there yet. Jack wasn’t cleared for on-field drills until a week before his March 15 Pro Day. Although his 40-inch vertical leap and 10-feet, 4-inch broad jump would have placed him among the top linebackers at the combine, he still needed more time to heal. When Jacksonville called to schedule a private workout with Jack, the logistics were difficult to work out. Jack was in New York City to film a Speed Stick commercial on April 11, a Monday, and then had to fly to Indianapolis two days later for his medical re-check two weeks before the draft. “Can you do it the following Sunday in Los Angeles?” Thornton had asked. The Jaguars said yes, then moved it to Saturday, then pushed it up yet again to Friday. Afterward, Bradley and general manager Dave Caldwell pulled Jack to a far corner of the field. Bradley began talking about defensive zone concepts, but Jack noticed Caldwell wasn’t engaged in the conversation—the GM’s eyes were fixated on his knee. A few minutes in, Caldwell interjected. “Is your knee swelling up?” he asked. NFL source calls Myles Jack "a time bomb" whose knee could give him several good years, or not. Bone and cartilage starting to break away. Though some teams reportedly removed Jack from their draft boards, Jack’s camp says that every doctor at the medical re-check expressed no concerns. Jack consulted multiple experts, including Dr. James Andrews and several NFL trainers whom Thornton knows. According to Thornton, they all cleared Jack and didn't believe he would need microfracture surgery. The narrative, however, changed abruptly two days before the draft. Jack appeared at an NFL Play 60 event in Chicago, where a group of reporters swarmed the prospect. The linebacker was asked to respond to conflicting reports about his health, and offered this answer: “[The degenerative problems are] there, but it's nothing extreme. Down the line, possibly I could have microfracture surgery—potentially. Who knows what will happen? Nobody knows how long anybody is going to play in this league. To play three years in this league would be above average." Jack’s honest comments during media availability at an NFL Play 60 event cast more doubts about his knee. The quote became a New York Post headline. Some questioned if Jack had sabotaged his own stock. Thornton, who was not present at the event, believed Jack’s quote was blown out of context as he was simply responding to rumors. Jack felt awful about the way it was construed and says he was just trying to answer honestly. His agent faced an impossible situation. He couldn’t come out and say, My client doesn’t know what he’s talking about. He also didn’t want to appear overly sensitive or argumentative. At least two teams called Thornton that night to make sure something hadn’t happened that they didn’t know about. 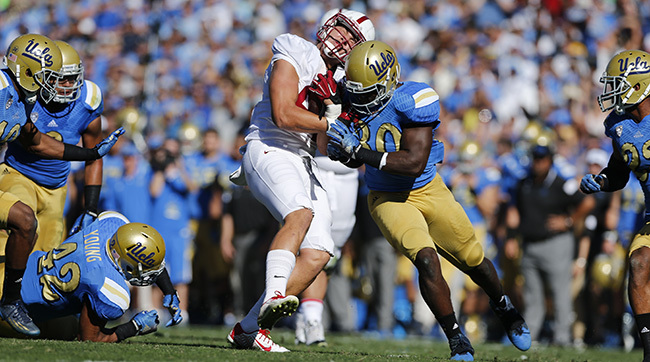 Knowing the first round could be hit or miss, Thornton gave Jack the option of not attending, but the linebacker wanted to be in the greenroom. He was joined by his girlfriend, brother, grandmother, agent, trainer and college coach. When the Jaguars were on the clock with the fifth pick, everyone hushed. When Jack’s phone remained silent and Florida State corner Jalen Ramsey’s was called, Jack slunk in his seat. There was still hope, especially at No. 14. The Raiders had worked Jack out a week before the draft, but they chose West Virginia safety Karl Joseph. Jack smiled at the encouragement, but left before the first round was over. When Jack returned from his basketball session on Friday morning, Thornton asked what he wanted to do for Day 2. He could return to Auditorium Theater, if he wanted, or he could go home. Jack wanted to stay in Chicago, but avoid the greenroom, so Thornton arranged for a conference room at his hotel, the Trump International. While Jack was working out, Thornton had a long conversation with Jaguars brass. He knew they were going to try to trade up for him, but didn’t want to tip his client, just in case something happened. “Doctors are like scouts and personnel evaluators,” Caldwell says. “Every doctor has an opinion, and ours consulted quite a few cartilage experts. We don’t feel Myles will need microfracture. Our feelings never changed from the scouting combine to the medical recheck." “Just make sure you arrive on time,” Thornton told Jack. Mora, who had returned to the West Coast, also received word before the choice was announced, via a text from Bradley. Just after 5:30 p.m., Jack’s cell phone rang with a 904 area code: Jacksonville. “You’re getting a steal,” the linebacker said. Bradley then embraced the linebacker. “You look awesome,” the coach said, patting him on the shoulder. Question? Comment? Let us know at talkback@themmqb.com.